The Hyundai Creta is by far the best selling compact SUV in the country and the second best selling SUV across all the segments, behind just the Maruti Suzuki Vitara Brezza. 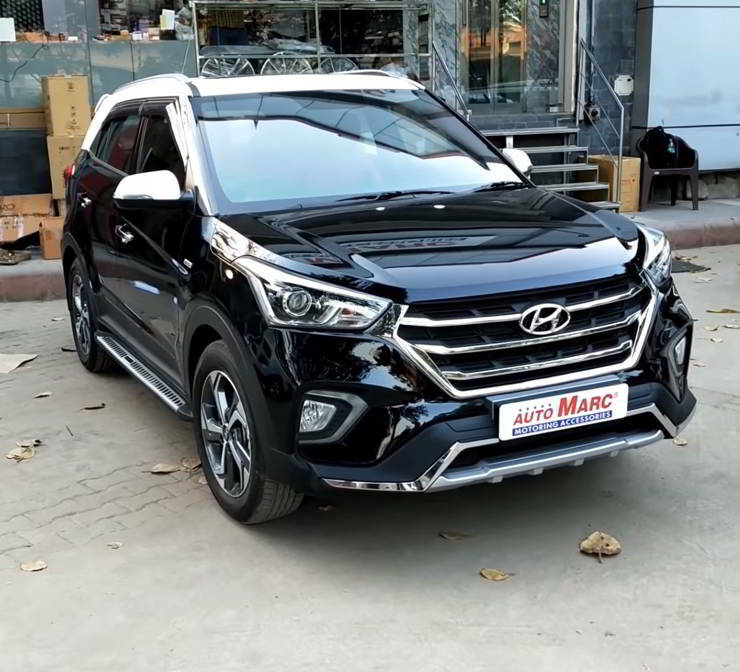 The Hyundai Creta became a best seller ever since its launch and left behind the previous segment leaders like the Renault Duster among others. It is also quite popular in the modification circuits across the country and a lot of cool aftermarket accessories are available for it. However, the Creta featured below has received a mod job that is focussed more on the lavish interiors than exteriors. Let’s now take a look at the video below by Turbo Xtreme which shows this modified Creta in its full glory. On the outside, the Creta here has received a chrome treatment on the bumper and some other places. The roof has been covered in pearl white paint shade which compliments the black colour of the SUV. A front bumper kit is also installed on the SUV for aesthetic purposes. Custom side steps have been added on the sides while the wing mirrors also get white paint treatment on them. Chrome garnishing is also added on the window sills and window visors have been placed to provide some shade on the interiors. The tail lights have been replaced with LED units with matrix indicators. A rear diffuser is also added at the back which further lifts the aesthetics of the Creta. However, the interiors are where the major work has been done. 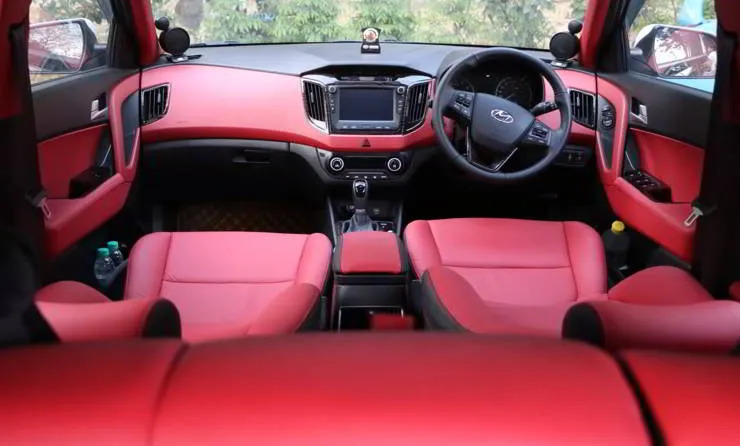 The whole cabin bow sports a red and black colour theme which looks pretty good as well as sporty at the same time. Most of the dashboard panels have been painted red as are the door pads and A-pillars. Fake wood garnishing has been added to the central dashboard as well as various other areas like the AC vents and steering among others. This further adds a touch of royalty to the interiors and gives it a unique look. The seats have been draped with red and black leather and the same theme is carried in the rear too. Further, an aftermarket audio system has been added on the Creta here which gives a boost to its in-car entertainment prospects. New floor mats have also been laid down which are two-piece detachable units. Such mats are easier to clean and also look good. Overall, this Creta has been tweaked on the outside but the real work has been done on the inside. It is one of those mod jobs which are less flashy on the outside and more focused towards comfort and great looking interiors. One can even go for full leather covering on the dashboard and door pads rather than painting them but that would increase the cost by quite a lot.